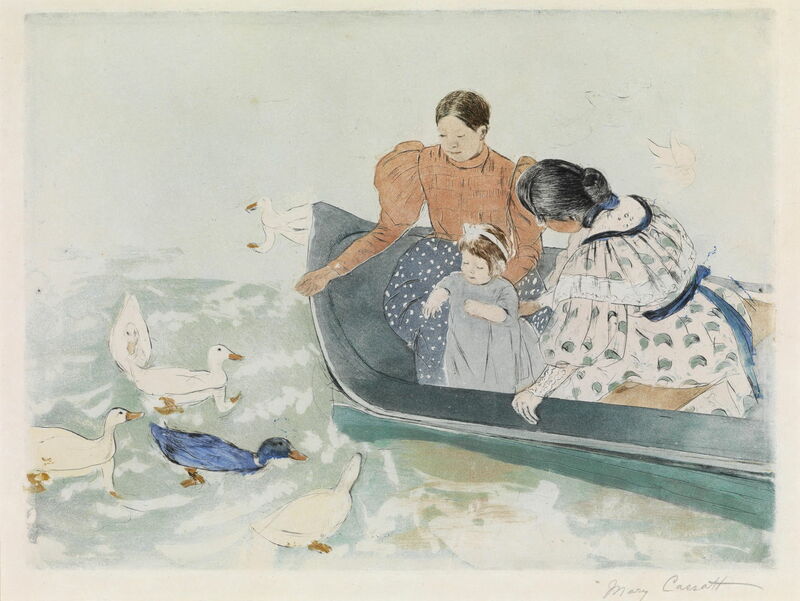 Mary Cassatt (1844–1926), Feeding the Ducks (c 1894), drypoint and aquatint with monotype on handmade paper, 29.5 x 39.5 cm, location not known. Wikimedia Commons. Drypoint involves cutting the image into a plate, traditionally of copper, later of zinc, using a tool with a fine point of metal or diamond. Because using that tool, or needle, is similar to drawing, artists already very experienced in drawing normally find this quicker to master than engraving itself. 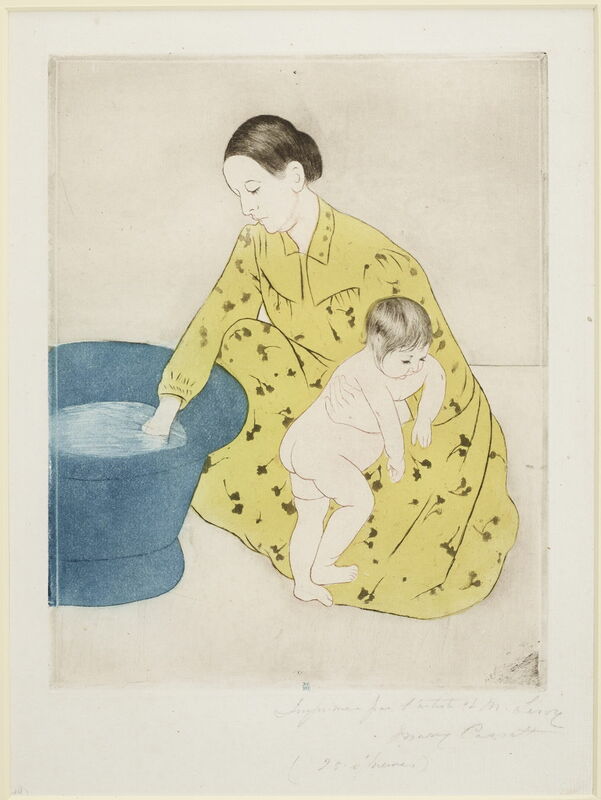 Mary Cassatt (1844–1926), Baby’s Lullaby (c 1887), drypoint, second state of two, 15.9 x 16 cm, The Metropolitan Museum of Art (H. O. Havemeyer Collection, Bequest of Mrs. H. O. Havemeyer, 1929), New York, NY. Courtesy of The Metropolitan Museum of Art. Cassatt’s first task, then, was to master drawing with the needle on a copper plate, shown well in her drypoint of Baby’s Lullaby from about 1887. This looks like a drawing, but is in fact the second of four prints or states made from the plate. Mary Cassatt (1844–1926), The Bath (c 1891), drypoint and color aquatint, 32.1 × 24.8 cm, Minneapolis Institute of Art, Minneapolis, MN. Wikimedia Commons. Within just a few years, Cassatt was producing magnificent work such as her famous The Bath (c 1891). For this, the plate was worked using drypoint, and aquatint, a form of etching, was used to add the two colours. For aquatint, acid-resistant ground is applied, and sticks to the plate, for example aided by careful heating. The plate is then exposed to mordant, an acid which etches into parts of the plate which are free of ground. The plate is finally used to print areas of colour. 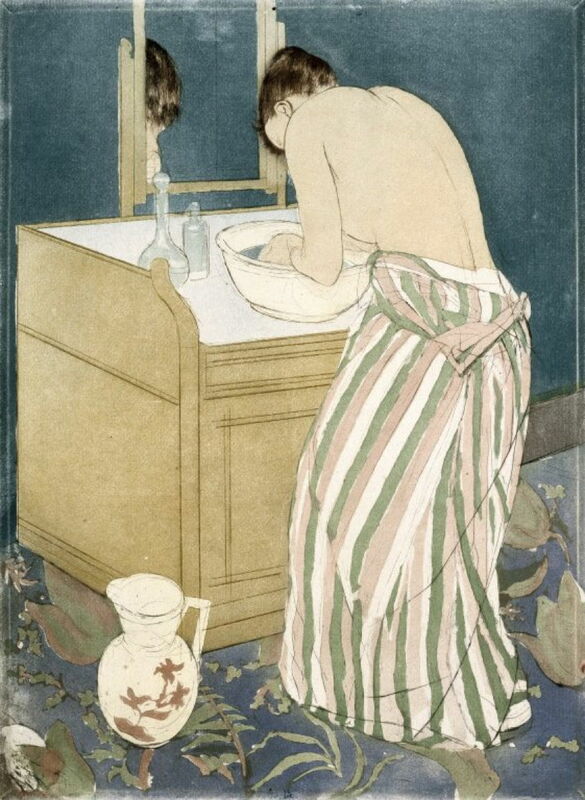 Mary Cassatt (1844–1926), La Toilette (1889-94), drypoint and aquatint on laid paper, 43.3 × 30.2 cm, Brooklyn Museum, New York, NY. Wikimedia Commons. In La Toilette (1889-94), Cassatt has used drypoint and aquatint to print multiple colours, including some quite fine details. This requires very precise printing technique to ensure the registration of the plate and paper. Her choice of motif for these two works is interesting, given Degas’ long series of works, mainly painted with pastels, showing women getting out of baths and at their toilet. Cassatt’s two prints explore exposed flesh much less than Degas’, and her work appears to have been more influenced by Japanese woodcut prints, which had become very popular in Europe by this time. Mary Cassatt (1844–1926), Summertime (1894), oil on canvas, 73.6 x 96.5 cm, Armand Hammer Museum of Art, Los Angeles, CA. The Athenaeum. 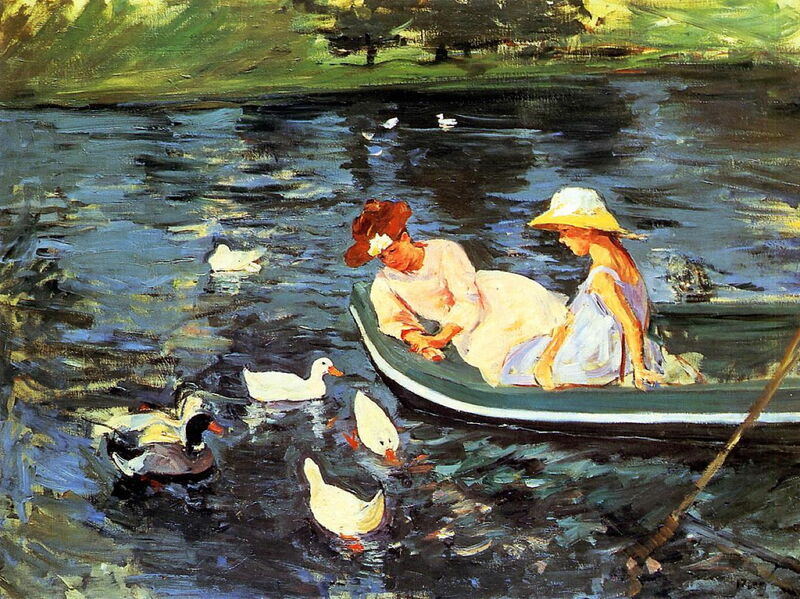 Cassatt had not stopped painting in oils, but concentrated more on portraits and scenes of motherhood and families, such as this very loose painting of a mother and daughter feeding ducks from a boat in Summertime (1894). I believe this was the source for another sophisticated print, called perhaps more appropriately Feeding the Ducks (c 1894), below. For this she again combined her mature drypoint with aquatint, to which she added monotype. In monotype, the artist lays down an image on a plate using printing inks, then makes a single impression of that on the paper. Once again, this demands meticulous technique, and usually results in one completed print for each image made in ink – second prints can sometimes be made, but are usually of low quality. Cassatt’s use of monotype was almost certainly the result of Degas’ influence and involvement. Degas had revived the art of the monotype in the 1870s, and it had also been used by Pissarro. William Blake has devised his own technique, in which he made lines using relief etching, and brought in areas of colour using monotype methods with water-based media. 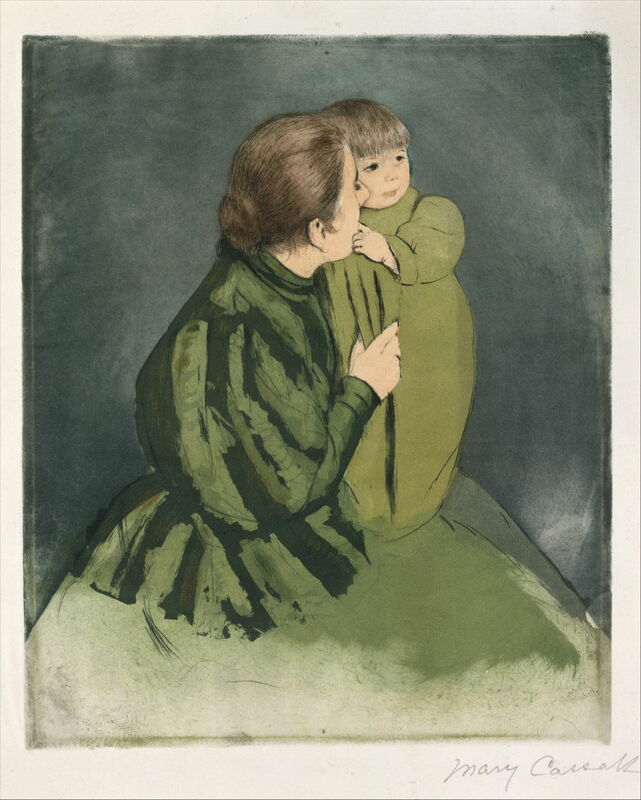 Mary Cassatt (1844–1926), Peasant Mother and Child (c 1894), drypoint and aquatint, printed in color from three plates, tenth state of ten, 29.2 x 24 cm, Metropolitan Museum of Art, New York, NY. Wikimedia Commons. 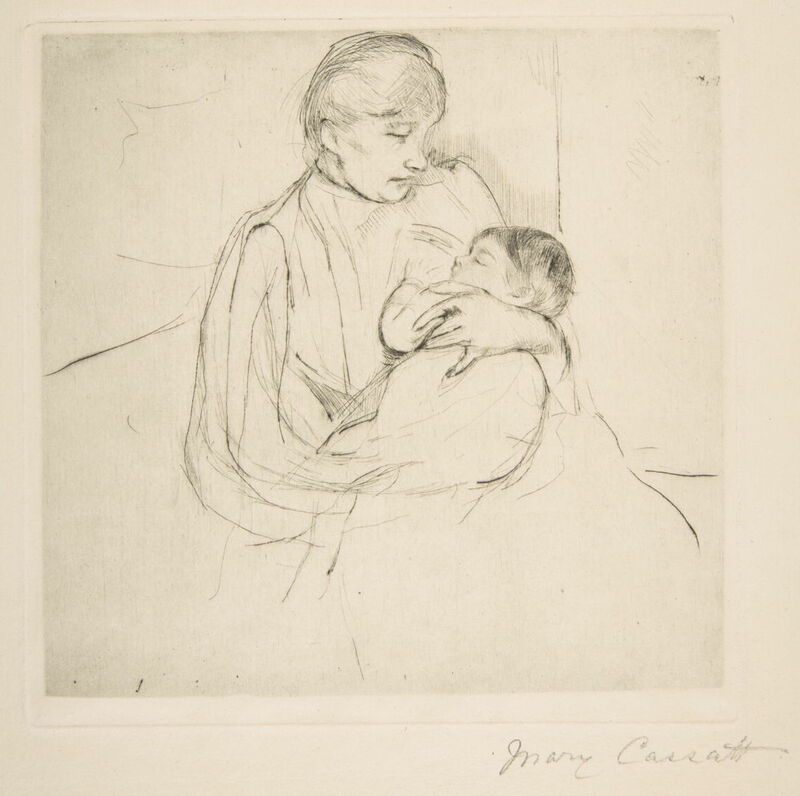 Over the same period, Cassatt made some prints with multiple plates, such as Peasant Mother and Child (c 1894). This used the combination of drypoint and aquatint, with colours applied from three plates. The benefit from such a complex method is that the yield increases: in this case, she was able to obtain ten states, which compares with the single print from monotype. I think that this may have been the closest that Mary Cassatt came to depicting poorer members of society in her work. Mary Cassatt (1844–1926), Young Woman in a Black and Green Bonnet, Looking Down (c 1890), pastel on tan wove paper, 52 x 65 cm, Princeton University Art Museum, Princeton, NJ. Wikimedia Commons. She continued to paint frequently in pastels. Young Woman in a Black and Green Bonnet, Looking Down dates from around 1890, and shows the rich range of marks she used, and their apparent spontaneity. Although in her print-making she had to work hard to give surfaces depth and texture, she had no such limitations in her pastel paintings. Her motif makes for interesting comparison with those of Degas. Cassatt’s model shows no evidence of being posed, and appears relaxed and natural. Her eyes are covered by the brim of her hat, which allows her privacy and self-respect. 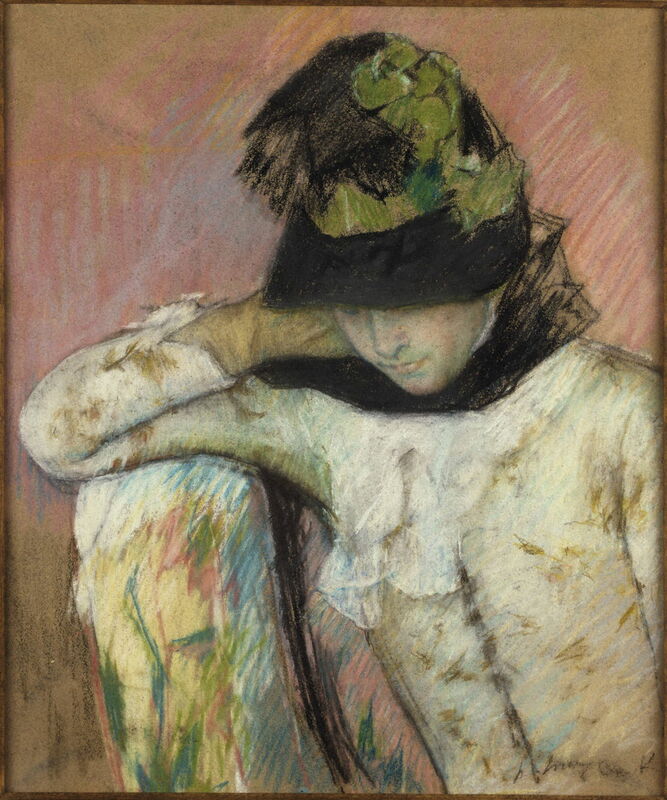 Degas and Cassatt shared many of their techniques, but their choice of motifs and their composition remained very distinct. 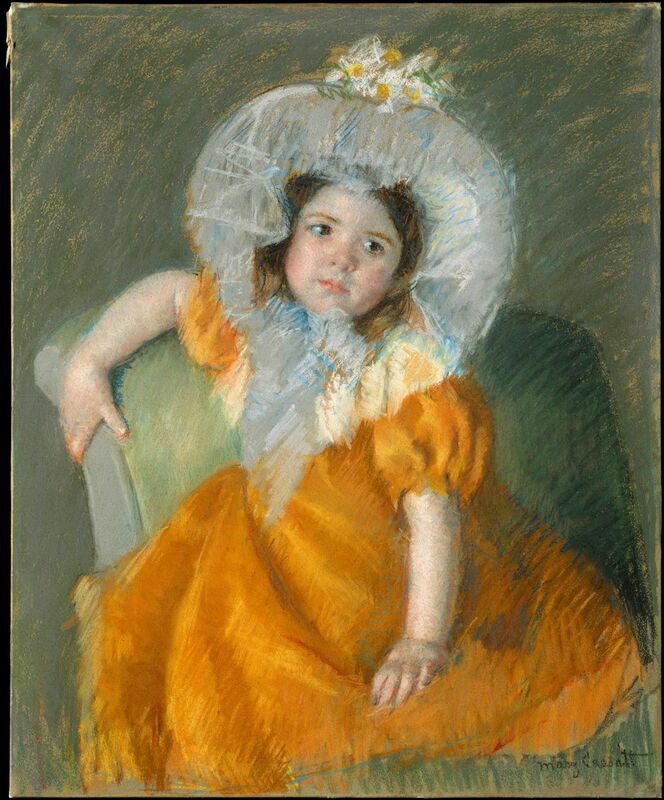 Mary Cassatt (1844–1926), Margot in Orange Dress (1902), pastel on wove paper mounted on canvas, 72.4 x 59.4 cm, Metropolitan Museum of Art, New York, NY. Wikimedia Commons. Cassatt’s art never grew bland, though. This superb pastel painting of Margot in Orange Dress (1902) is as vibrant in colour as the works of many of the post-Impressionists of the day. One of the few techniques developed by Degas which Cassatt doesn’t appear to have used at any time was his peinture à l’essence, using oil paint with much of the oil medium removed. Cassatt appears to have kept to the methods she learned during her training in Paris – given the problems in the paint layer which can result from removing the oil binder, this is perhaps just as well. At the end of 1894, Degas and Cassatt grew further apart as a result of the Dreyfus Affair, a national political scandal in France which centred on the conviction for treason of an officer in the French army, a relative of Cassatt’s patron and friend, Moyse Dreyfus. As he had grown older, Degas had become more overtly anti-Semitic, which must have angered Cassatt. She actively supported women’s suffrage, but by 1914 deteriorating eyesight and increasing infirmity forced her to stop painting. Degas died in 1917, Cassatt in 1926. Both were major artists whose work continues to have great influence on art, and they are each so wonderfully different. Posted in General, Life, Painting and tagged Blake, Cassatt, Degas, Dreyfus, Impressionism, painting, pastel, Pissarro, prints, women in art. Bookmark the permalink.